Get the party started with our Simple Fruity Red Sangria Recipe. 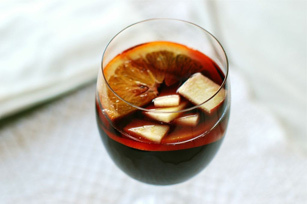 Simple syrup, apricot brandy and wine give this red sangria recipe its deep, rich flavor. Mix the red wine, brandy, iced tea and simple syrup in a large pitcher. Then, garnish with fruit.